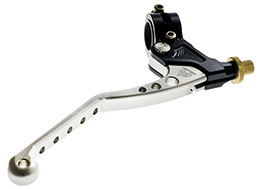 Vintage Style Clutch And Brake Levers. For 1” Or 7/8” Handlebars. Published by Cyril Huze December 11th, 2016	in Controls, Customs and Editorial. To go retro style to the tips of your fingers. 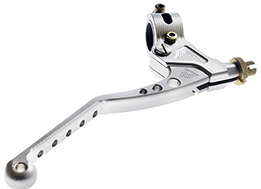 These new drilled and bent clutch and brake levers could have been the stock offering on many classic and vintage bikes. But these ones are CNC machined 6061 billet aluminum, looking much better than those in cast of the past. 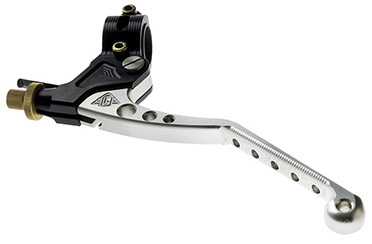 The lightweight levers feature ergonomic 3D machining. They come with a 10 mm brass cable adjuster (8 mm adjuster is an option) The cable clutch adjustment clip makes it easy to adjust the clutch cable. Stainless steel pivot pins and hardware. High quality “OILITE” bronze bushing on levers for super smooth action. Available in clear or black anodizing. Order online at Joker Machine. Top shelf products from Joker Machine.